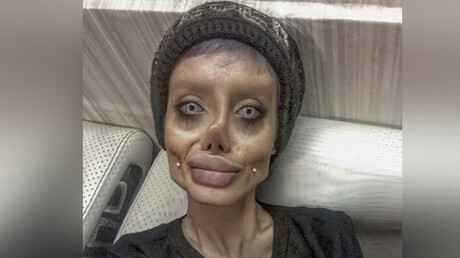 An Iranian woman who reportedly had 50 plastic-surgery procedures to look like Angelina Jolie has been mocked online, with critics saying she looks more like a “zombie” and a “corpse bride” than Brad Pitt’s ex-wife. Sahar Tabar admired the Hollywood actress so much that she decided to go under the knife to look exactly like her, undergoing some 50 surgeries in just a matter of months, according to Belgian newspaper Sudinfo. She also reportedly lost 40 kilos (88lbs) in an attempt to achieve Jolie’s slender figure. Tabar has not publicly confirmed the plastic surgery reports, and many online claim her look is the product of makeup, prosthetics, and Photoshop. However, she does appear to be wearing a bandage over her nose in many of the photos – which could be a sign that she has indeed gone under the knife. As Hollywood Life pointed out, her nose is different in different photos, which could indicate that special makeup effects are being used alongside plastic surgery. Although the Jolie fanatic removed all of her “before” photos from her Instagram account, British media outlet The Sun reportedly found one and published it. The woman – who is either 19 or 22, according to conflicting reports – isn’t the only person to make headlines for trying to look like a famous figure. A man in the US has dedicated his life to looking like a real-life Ken doll, even going so far as to gain extra pounds so the fat could be used to plump up his buttocks. Others have also made headlines for trying to look like Barbie dolls, while New York woman Jocelyn Wildenstein, dubbed ‘Catwoman,’ has undergone countless surgeries to look like a feline.